These fold-out foot pegs are designed for use with The Buddy Bike. Riders on the front seat must have a 25" inseam to be able to pedal the Buddy Bike. Buddy Bike Fold-out Foot Pegs allow smaller children or tired riders to rest feet out of the way of the pedal path while they enjoy the view and the ride. A manual is not included but they are easy to install on the down tube in front of the stoker (front rider) seat using a 5 mm allen key. Weight 11 oz (312 g). FOR BUDDY BIKES: If you are ordering fold-out foot pegs for the Buddy Bike, you will need part number FP100-31.8-A. These foot pegs fit a 31.8 mm (1.25") tube w/3.93" circumference. 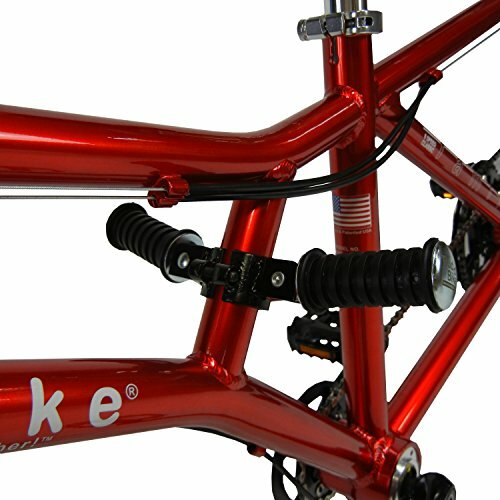 These foot pegs fit all aluminum frame Buddy Bikes. They do not fit our previous models BB100 and BB101 with cro-moly frames. OTHER BIKES: If you are ordering fold-out foot pegs for a bike other than a Buddy Bike, you should check your tube measurements and review our return policy carefully prior to placing your order. If the foot pegs do now work for your bike, you will have 30 days to return them for a full product refund excluding shipping costs. For other bikes, see our foot peg option, part number FP100-34.9-A which fits a 34.9 mm (1.375") tube w/4.32" circumference. If you have any questions about this product by Buddy Bike, contact us by completing and submitting the form below. If you are looking for a specif part number, please include it with your message.